You've got something that needs quick cleaning before guests arrive, but you're hesitant to pull out the pressure washer because of how painfully frustrating it can be to screw together all of the hoses. So you end up just using the spray nozzle on your garden hose, but that doesn't quite do the job, and it takes a lot longer too. If only there was a way to quickly snap together your pressure washer hoses and just get the job done right. 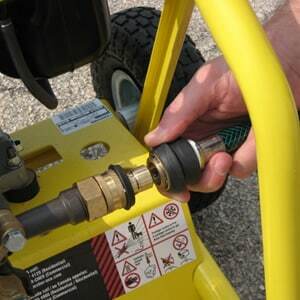 Well, we've created the Ultimate Quick Connect Kit for pressure washers. Now, everything just snaps into place. No more twisting corroded connectors, no more sore fingers, and your home and belongings can be clean in time for the in-laws' arrival. These connectors will make set up and tear down of your pressure washer system a breeze. 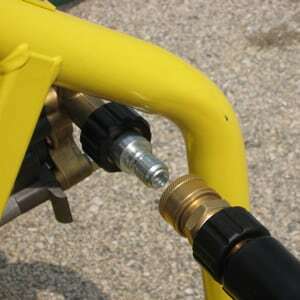 One set of connectors connects your spigot and your garden hose. Another set of connectors connects your garden hose to the pressure washer, then the third set connects your high pressure hose to your pressure washer pump. 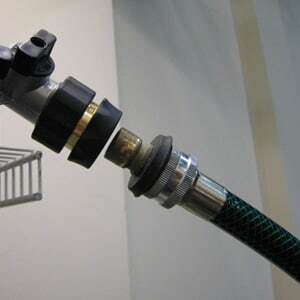 Some kits even come with a connector for attaching your spray gun to your high pressure hose. Sure, you have to screw them all on, but only one time. Once you've got them on, you never have to take them off - just snap them together and slide them apart from then on. Do I Need to Buy the Whole Kit? You don't need to buy the whole kit. If you only want one or two of the connectors, that's fine. However, buying them all as a kit saves you money. Buying individual pieces will cost more in the long run, and you'll probably find that you'd rather have the whole kit anyways. The constant screwing and unscrewing of components will wear the thread down and make it much harder to connect the pieces together without any leaks. Quick connects help to preserve the thread and seals on your components, extending the life of your pressure washer system.